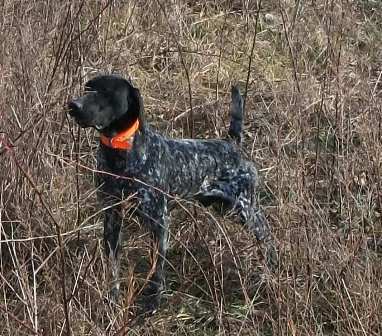 Southern Missouri Shorthairs - June 9 Litter Dam: Ward's Bonnie Lass Sire: CRK's CopperFemales $1000. shipped / $750 picked upMales $950 shipped / $700 picked up $300 deposit to reserve puppy. Deposit accepted by PayPal or WalMart MoneyGram. Puppy not reserved until deposit is received.﻿﻿ Puppies will be ready to travel Aug 4, 2015. Includes flight, travel crate, current immunizations, health check and certificate, microchip, AKC litter certificate and unlimited registration application.﻿ Crate not provided for pups picked up. Dam pedigree includes FC Dolly’s Big Is Junker V Grief, FC/AFC Bluemax Spitfire V Grief, FC Rawhides Lucky Moon, FC/AFC Sieg Heil, FC Heide Ho-Pinehurst, FC Bmk’s Strike The Gold, CH Stradivasius Maximilien, NFC Heide’s Mighty City Slicker, NFC/FC Sanjo Sin City Slicker, and FC Sin City Savonara.